The winner of the 15 International Frederick Chopin Piano Competition in Warsaw Honorary citizen of the Kuyavian and Pomeranian Region of Poland. 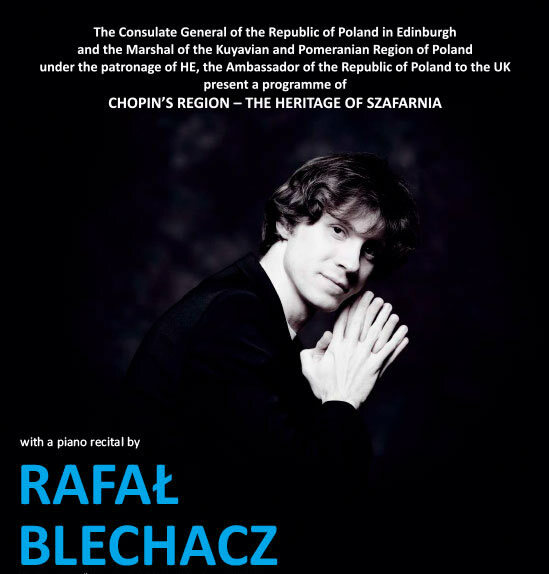 Rafał Blechacz, current winner of the quadrennial Gilmore Artist Award (sometimes called ‘The Piano Nobel’), and a first prize winner of the Chopin International Competition. Praised by the great pianist Martha Argerich as “a very honest, extraordinary and sensitive artist,” he’s only the second Polish artist — after Krystian Zimerman — ever to be signed by Deutsche Grammophon. He has already released five albums on the label, including three on his compatriot Chopin. He brings that renowned interpretation to The Queen’s Hall along with works by Bach and Beethoven. After eleven years since the victory in the 15th International Chopin Piano Competition in Warsaw in 2005 he has achieved a position of the truly world-famous artist. His outstanding talent has been appreciated by the audiences of Europe, America, Asia, by music critics, great conductors and famous symphony orchestras, record producers, managers and artistic agencies organizing concerts in the most famous concert halls and in the largest music centres.